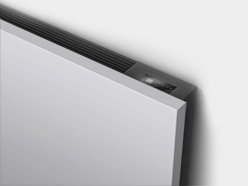 With the Niva fan convector you can cool your home in an energy-efficient way. This system, which works at low water temperatures as of 35 degrees, is particularly interesting in combination with a heat pump. The Niva fan convector can be used in all rooms of the home, but is especially suitable for the bedroom. In this way your house remains not only pleasantly warm in winter, but also delightfully cool in summer.